I like playing music and I used to be fairly serious about percussion. I studied orchestral and marching percussion, solo 4-mallet marimba, and classical piano for over 10 years, and played in several orchestras and ensembles during high school and college. Now I’ve lost a lot of my skills, but I still like playing with friends for fun, and I’m trying to get better at rock drumming. I'm also trying to get better at writing, arranging, and producing music, both live and electronic. My Pixar band! We only play at work events, but maybe one day we’ll do a real gig! We mostly play covers, but since we all have different tastes in music, we can rarely agree on what to play. We’ve covered songs from Muse, Pokemon, NIN, Puscifer, Florence and the Machine, Britney Spears, Diablo Swing Orchestra, Of Monsters and Men, Ghost, etc. Very random. 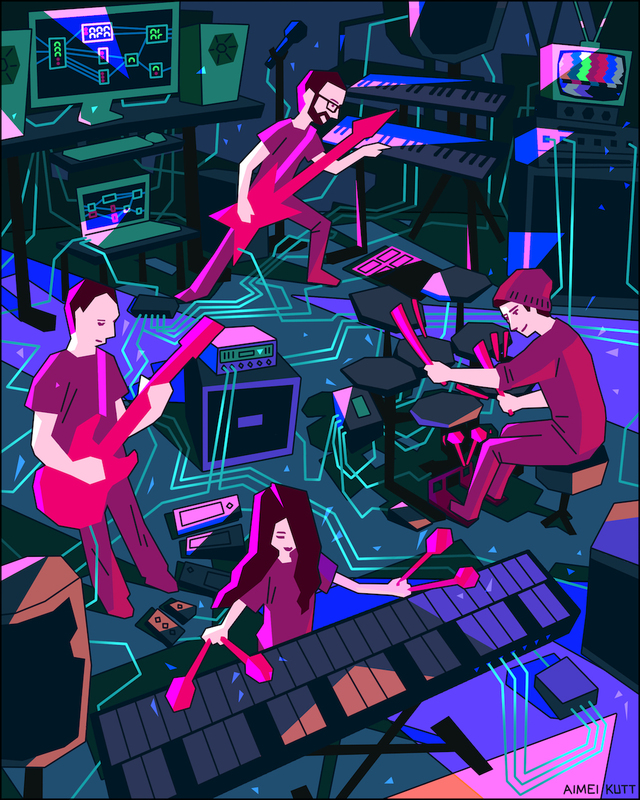 We’ve written two originals, and try to keep things interesting tech-wise on our covers. Of course Duck & Cover has a side project… “Computer Metal” is a temporary name, maybe. Just jamming with midi controllers and guitars, with a more electronic/prog metal slant. I’m on Xylosynth (a midi xylophone) this time, playing a lot of the melody lines and 16th note bleep bloops. We mess up a lot. Paul arranged some of our jams into more coherent songs. Sometimes I try to write songs for fun. Here’s me channeling my best Trent Reznor with some silly simulation-angst-themed electronic/industrial songs I wrote in Logic. I don’t hate the instrumentals, but I really wish I could sing and write lyrics. Maybe I could practice, but for now here’s some bad singing. ...And some songs from the late high school/early college period when I was obsessed with writing techno music. DJ iMei! Just messing around in Logic and Garageband (and FruityLoops in the beginning.) The songs aren't great and the names are cheesy, but eh I'll post them here because who's listening. Most of them are original, but a few are remixes/arrangements. I only wrote the instrumental parts and melodies, none of the lyrics. I was experimenting with live performance mixed with pre-recorded electronic music. I wrote the song based on some of the motifs in "Variations on Japanese Children's Songs" by Keiko Abe. And I often debate sharing this, but here's a silly music video I made for my techno song during my first college winter break. Was pretty bored. All practical effects, zero camera skills, and edited in iMovie! unfortunately.